These sturdy rain collection systems are easy to use and will last a lifetime. Texas Metal Tanks began in the 1930's in Yoakum, TX. After locations in Yorktown, Buda, and San Marcos, tanks are now made in a 5000 square foot building just north of Dripping Springs, TX. Each tank is still formed by hand. Sustainability is a key part of their vision - unlike a plastic tank which may spend a thousand years in a landfill when they've reached the end of their useful life, their metal tanks are nearly 100% recyclable. 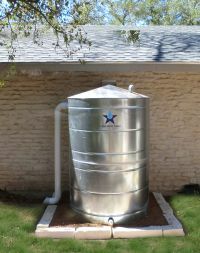 Blackland Supply Co offers a range of smaller sized tanks, or you can visit their website for sizes above 200 gallons.